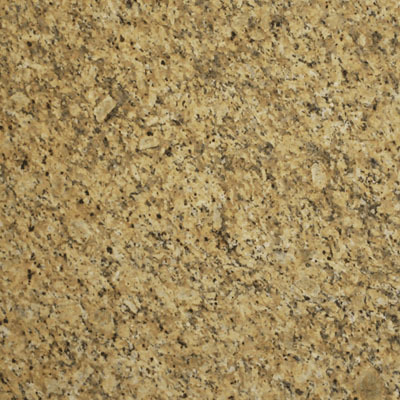 New Venetian Gold Granite (Commercial) features beige and golden tones with light veining of deep reds, grays and browns. This granite is available in a polished finish and both slabs and tiles. Please see the disclaimer below for more information on Commercial Material characteristics. Commercial stone may include some or all of the following characteristics that are typically undesirable and are perceived as defects. These characteristics can be caused naturally in the Earth, or due to the mining and fabrication processes in their respective quarries. Fissures are a naturally occurring stone characteristic. It is caused when two magma flows meet in the Earth. Then when the stone is formed, this union is visible as a vein in the stone. Although present in most granite, commercial grade materials may contain a higher concentration of fissures or larger fissures that can affect the structural integrity of the stone. Inclusions are also naturally occurring characteristics of stone. Most stones have inclusions and may give the stone an exotic look in the right proportions. However, inclusions in stones that typically have a consistent pattern may cause an undesirable look. Stone slabs are quarried from the Earth as huge blocks of stone. Blocks are transported to manufacturing facilities, where they are sliced like a loaf of bread and are gauged to 2cm and 3cm thicknesses. All stones have a slight variation in the thickness, ranging from 1/64 to 1/8. However, in commercial material, the difference in thickness can be extreme; in some cases up to 3/8” have been seen. Once the stone is cut, it is placed in production for polishing. During this process, resin is applied to fill pits and chips in the stone to give it a smooth and shiny finish. Pits are common in most stone and are caused by various reasons. The most common reason for pits is the mica content in stone. The polishing process causes the mica to flake, creating shallow pits that cannot be filled or polished. Slab manufacturers around the world may produce a finished product with a poor resin or no resin finish, giving the stone a dull look with pits. These stone should be considered and sold as commercial grade products.